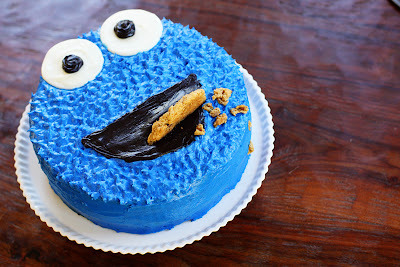 Do you remember this cute Cookie Monster cake I showed you the other day? Well, here’s the inside… and it’s an absolutely delicious, very grown-up friendly dessert! 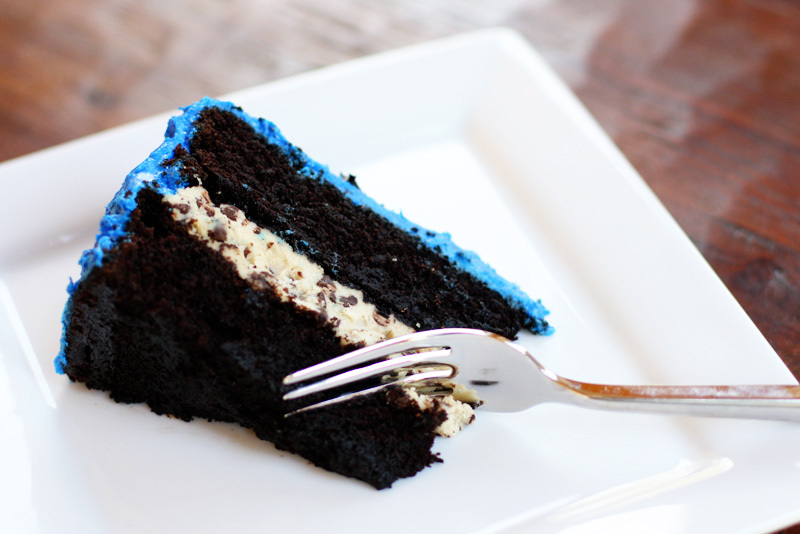 Moist, dark chocolate mocha cake, with a delicious layer of (eggless, of course!) 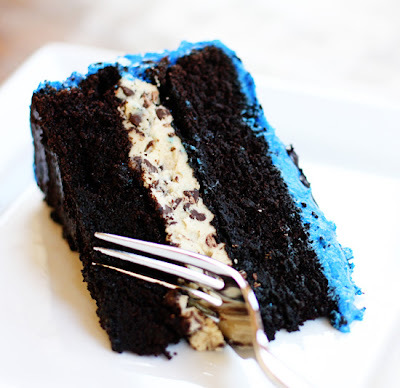 cookie dough in the middle… Pretty much heaven in cake-form! It was a big hit with both the kids and adults at Bjørn’s party… and I have to admit, I’ve been sneaking some of the leftover cookie dough filling the last few nights before bed! Blue frosting and the Cookie Monster theme are definitely not required for this cake… but they sure do make it fun! Preheat the oven to 350ºF. Grease and flour (or use a baking spray with flour in it!) two 9-inch round cake pans. In a large mixer bowl, whisk together the sugar, flour, cocoa, soda, powder & salt until combined. Add in the eggs, milk, oil & vanilla and mix well, on medium speed for about 2 minutes. Stir in the hot coffee until the batter is smooth and thin. Pour evenly into the two pans and bake for 30-35 minutes, until the cake is set and a toothpick inserted in the center comes out clean. Cool the cakes in the pans for 5-10 minutes and then flip out onto a wire rack to cool completely before filling and frosting. In a mixer bowl, cream together the butter and sugars until smooth. Mix in the milk and vanilla until smooth. Mix in the flour until just well combined and then stir in the chocolate chips. I used a simple vanilla buttercream frosting recipe (this one) for my cake because I needed to decorated it like cookie monster. I would probably use a milk chocolate buttercream or even my Nutella buttercream frosting if I wasn't trying to decorate it that way!